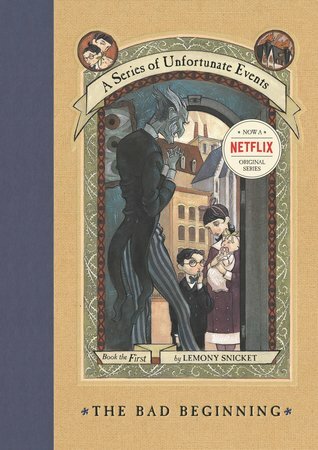 For December's Book Club, we read A Series of Unfortunate Events: The Bad Beginning by Lemony Snicket. Abigail, Alba, Amelia, Ava, Claire, Finley and Lauren were present. This is some of what we talked about. Which one of the Baudelaire children do you most identify with? Violet? Klaus? Or Sunny? -Sunny, because she has the ability to bite stuff. -Violet because she's creative and she likes to invent stuff. Plus, she's brave. -I am a mixture between Violet and Sunny. Sunny took risks and Violet is funny, kind and fun. Violet threw the grappling hook and risked her life to save Sunny. -Klaus because he likes to read a lot. -Violet and Klaus because he likes to read and can memorize anything in his books. Violet is creative and she likes to help her siblings. -Maybe Count Olaf burned down the house to kill the parents in order to get the money. -A mysterious fire happened and they don't know how it started. Why are all the adults in this story so darned incompetent? In the end, which adult is the very worst? Is it Count Olaf? Or is Mr. Poe just as bad? Maybe Justice Strauss should have done more to help? -I think Justice Strauss should have fought harder for the kids. -Mr. Poe because he doesn't listen to the kids, even when the truth is right under his nose. -I think Mr. Poe because he could have helped with many things (he could have checked on them to make sure they are okay). -I think Count Olaf because he tries to marry a 14 year old to get her money. -I think Mr. Poe and Count Olaf because Olaf wasn't protective and he only gave them one bed. Mr. Poe didn't check on them and to see if they were doing okay. He didn't listen to them when they told him about Count. -Count Olaf and Mr. Poe. But Mr. Poe isn't as bad as Count Olaf. -I also think Count Olaf is worst because he ties Sunny to a tower. -Mr. Poe is worst because he coughs a lot (he can get them sick) and he didn't come to check on them even though he promised he would. He didn't have time for them. Even though the kids made the effort to get to the bank, he ignored them. -If Mr. Poe hadn't contacted Count Olaf, they might not have been in the play. -The guys who work for Olaf might not be as bad as they seem. -Count Olaf and Mr. Poe are equally bad. Count Olaf was going to marry Violet and steal her fortune. That's creepy that he wanted to marry his own child. -Mr. Poe should have listened more to the kids. The kids should tell Mr. Poe that he needs to start listening to them. Compare and contrast Count Olaf and Justice Strauss. Why on earth won't Mr. Poe just let the Baudelaires live with that nice lady? -He was following the rules and would only let them live with whoever was closest to them. -I think Mr. Poe is following the rules. He should have realized that Justice Strauss would be the better guardian. Maybe he could have done a split arrangement so that the kids live part of the time with Justice Strauss and part somewhere else. What role does money play in the story? How is the Baudelaires' enormous fortune both a blessing and a curse for them? -It's a blessing because they can buy whatever they want. But it's a curse because everyone wants to steal their money from them. -It's a blessing because they can buy themselves better things than Count Olaf will give them. It's a curse because Count Olaf tries to marry Violet so that he can control her (his wife's) money. -I think it's a blessing and a curse because when they ask for money to do things for Olaf, they are forced to use their own. It's a blessing because they would have enough money to support themselves if they run away. -They can't use the money until they are 16. If they ever wanted to go, they could break the law and use the money. What's up with all the creepy eyes in Count Olaf's house? Is he really always watching the Baudelaires? -They are actually the eyes of his team. They are behind the walls watching them. The eyes could be little cameras. Or he could be obsessed with different kinds of animal eyes. He might be using magic. -I think it's a symbol for something and it represents something. -He has an eye tattoo on his ankle. I agree, maybe it's a symbol of something evil. -There could be many tattoos on Count Olaf that we just haven't seen yet. -The eye on his ankle might be something that Count Olaf really wanted to remember (the group was split on whether the memory was good or bad). When the children lose their parents, does their relationship with each other change? How? -I think they are closer because they realize they have to stick together to take care of each other. -I think they have decided to stick together. -They have decided to stick together because they have no one else to count on. And then they continued to stick together. Why is this book divided into thirteen chapters? Does Lemony Snicket just love unlucky things? -I think Lemony Snicket does it on purpose. He made it even more unhappy with that number of chapters. -I think that it could have been a coincidence but I think he did it on purpose. People might not have noticed it at once. -He made it 13 chapters because he wanted to lengthen the story. And he wants to get the reader to feel like they know the story and the characters. -I don't think that it's a coincidence because it's supposed to be an unhappy book. If people recognized the number of chapters, they might notice the story and the structure. Please rate this book between 1 and 5, with 5 being one of the best books you've read. -Everyone ranked it a 5! For January's Book Club, we will be reading Paper Things by Jennifer Richard Jacobson. We will be meeting on Wednesday, January 10 at 3:00 p.m. Copies of the book will be available at the Circulation Desk. Please be sure to register so that Miss Lisa knows how many snacks to provide!